Get spooked this Halloween … Russian style! Come get freaky, and freaked out, with us this Saturday, 26th October. Come in costume for free entry, otherwise it’s a scarily low $30 per entry. The best-dressed stands to win frighteningly great prizes! 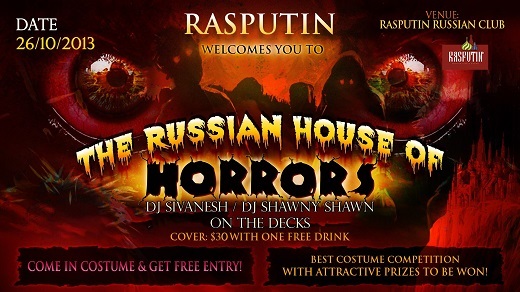 For further information, visit Rasputin facebook page. 2nd Prize: A bottle of Dom Perignon champagne. 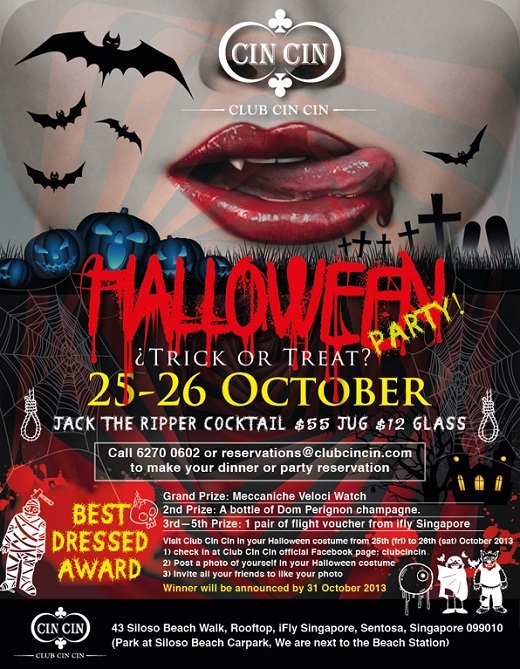 For further information, visit Club Cin Cin facebook page. 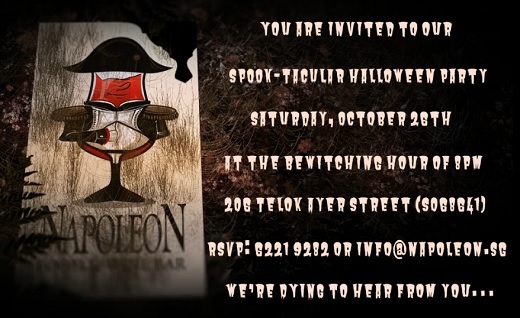 You are invited to our SPOOK-TACULAR Halloween Party, Saturday, 26th of October, at the bewitching hour of 8pm, at Napoleon Food & Wine Bar! Buffet Free flow all night for $35 net (for registered guest*)! Everyone should try to come dressed up! We will hold a contest and the winner with the best costume wins a bottle of Bubbly! For further information, visit Napoleon Food & Wine Bar facebook page. Mad Thrills is back once again, but this time round with a different taste which will set to play in Haunted Mansion. Come all dressed up for Halloween and appear at door before 12mn to enjoy waiver off cover charge. For further information, visit Mansion Bay facebook page. Don’t you just love a good story? Especially a good ghost story? But what if it was real? – You will choose 1 of 6 Undead captains introduced to you via the FB event page to form your team of 9. – The evening will start with clues posted to the event page at 12:01am 31st Oct 2013. – You and your team will compete and race against the clock to find the mystery Halloween Ghost Bus before 7.30pm. – Prize for the winning team. – We then embark for a tour of mystery, paranormal activity and real adventure. With a pub stop or two along the way. – Finish at Beer Garden Joo Chiat road 10.30pm. 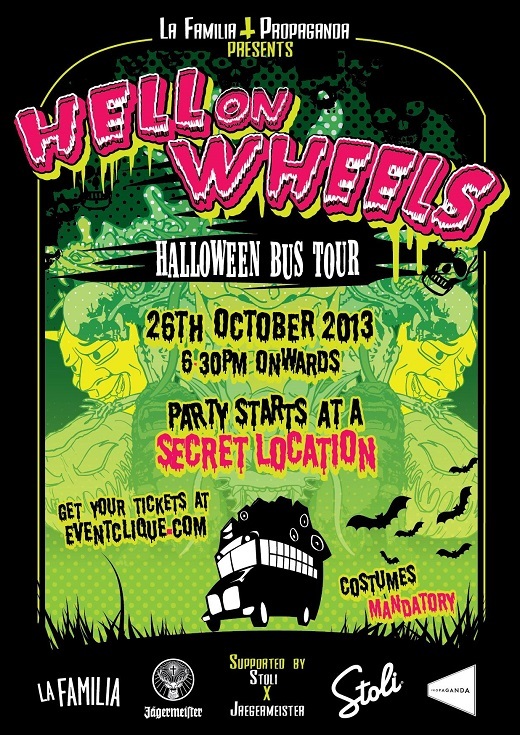 For further information and to buy event tickets, visit 2013 Halloween Ghost Bus Facebook Event. Friends, and party animals. It’s time again, for Stereometa to give you a reason to unwind, get loose and get crazy with us. Follow us into the madhouse as we unravel the story behind polly and her friend. A halloween celebration gone awry? A photo badly taken? What lies in the haunted mansion?? To join us in this adventure, simply put on your wackiest armor and some worn army boots.. throw on a battle shield for protection and perhaps a light saber and bring a cat. Along with a cheesecake to feed the cat and then you’ll need a bottle of vodka to ease your cat’s tummy ache and red face paint for blood and unicorns and butter dipped in maple syrup… or just dip yourself in maple syrup. JUUUUUST KIDDING. or not. Wear whatever you want, the craziest outfit of the night will stand to win a secret prize. or a chance to enter the secret chamber of The Asylum. WAIT, did i say each ticket comes with a FREE DRINK? Whoops, what are you waiting for? It still is all about doing the Forbidden things in 2013. Tickets can be purchase at the venue and preorder online. For further information, visit Stereometa facebook event. Come join us at our very first Halloween party held on our rooftop bar! A fun-filled Halloween party under the stars. Chill-out at our rooftop bar with our favourite horror fest. For further information, visit Supply & Demand facebook page. 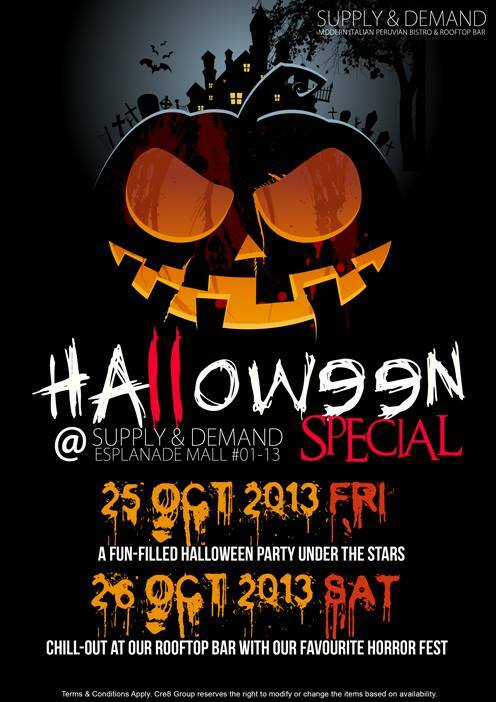 Put on your best costumes this Halloween and come down to Clarke Quay for a smashing celebration! Featuring 98.7FM DJs Rosalyn Lee and Vernon A, a variety of exhilarating games are lined up for you with attractive prizes up for grabs! Also, enjoy live band performances by Raw Energy, face painting, scary roving characters and much more! For more details, tune in to 987FM from 7-26 Oct 2013. So what are you waiting for, come on down this Halloween and enjoy a spooking good time! For further information and to buy event tickets, visit Clarke Quay website. To those of you who managed to survive last year’s Hell on Wheels without blacking out, you already know the deal. Find a hideously grotesque costume (please no mankini thongs, and if so deep follicle Brazilian waxes are a must) and do the zombie shuffle. Remember, costumes (not just limited to the bedroom) and an unhealthy penchant for drinking are mandatory. All boring bodies will be chucked out. Bus tour includes free entry & first drink at four exclusive bar/clubs, and a copious amount of booze on the bus. Party starts at Lime House. Forward this on to all of your vampire and zombie friends. For further information, visit 2013 Halloween Bus Tour Facebook Event. Once October rolls around, we’re already starting to plan on the big weekend of events. What’s more exciting than Christmas, and even more festive than New Year’s? Halloween of course! This year, we have partnered with Singapore Sling and Swiss Beer as our distinguished sponsors. So prepare yourself to have an unforgettable Halloween in Singapore as the organizers of Singapore’s biggest pub crawl, SINGAPORE PUB CRAWL are ready to break into the record books yet again by producing another massive event during the most popular time of the year to party! Don’t worry about having to stick to one bar/club in Singapore, as SINGAPORE PUB CRAWL is producing the biggest Halloween pub crawl in town! Featuring some of the top bars in the city filled with costumed guests enjoying drink specials, this is one experience you won’t forget! – We get on and experience the open top party bus. 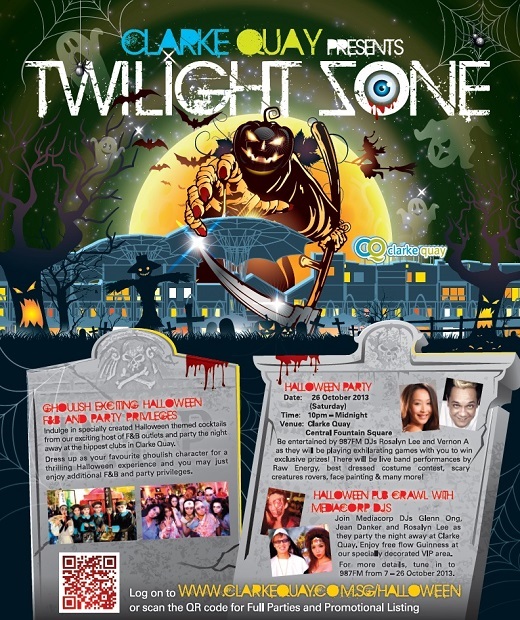 – Party through the streets, visit 3 Halloween themed bars and 1 MEGA club ! – Join other costumed guests in the bars. – Free shots! Free club entry! Exclusive Drink Specials! – Party the night away at Clarke Quay. – Freebies for each crawler to be given away! We have enlisted the help of some of the top bars in the city to host phenomenal drinks specials throughout the day for this special pub crawl. This is the perfect chance for you to enjoy great drink specials, visit some of the best bars in town, and meet new friends while you’re at it! For further information, visit 2013 Singapore Pub Crawl Facebook Event. 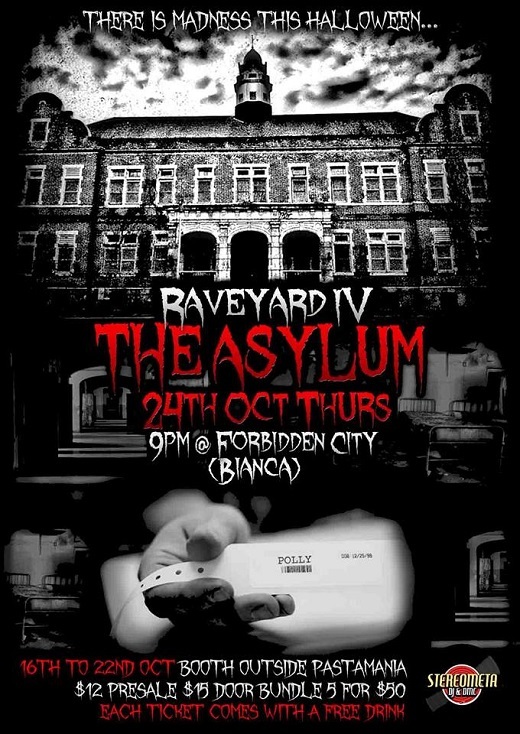 The highly anticipated HALLOWEEN RAVE UNDERGROUND is back for it’s 6th year running! 1,200 people attend every year! 1. Huge Secluded Spooky Mansion (1200 pax capacity) converted into a rave party venue. King sized Garden! 2. Bus-Ride from campuses to Secret Location Convenient! 3. A complimentary drink (Beer/ Spirit House Pours). 5. Great DJs! Music = R&B+Hip-Hop+Top40s+House+Electro+Bollywood. 6. A hauntingly good time seeing everyone dressed in Halloween Costumes. 7. Beer drinking Games and Best Costume Contest! 8. The bragging rights to say you attended this highly awaited famous event! The party venue is at a Mansion, tucked away in a secluded area surrounded by thick vegetation. We wish we could tell you more, but the location is a SECRET surprise! Its a different location from last year! Chartered buses will pick you up at the designated convenient venues in your respective schools (NTU, NUS, SMU) and ferry you to the “Underworld”. You won’t know exactly where you’ll be taken to till the night itself! To bring shivers down your spine, there will be a ghost trail (weather dependent) in which you will find your way through the darkness to the haunted mansion. Beware of the evil that lurks in the forest for they are hungry for the innocent! Veteran guest DJ’s with killer instincts will playing your favourite music – (House, Hip-Hop, R&B, Top 40s). Enjoy great company in an exclusive mansion with a spooky atmosphere! This event is open to anyone who loves to party and above 18 years old. So spread the word and invite your friends to join us for a great night of excitement, thrills and chills! For enquiries, please call SingaporeUNI at 97259955. Celebrate Halloween like never before! Spook ya laters! 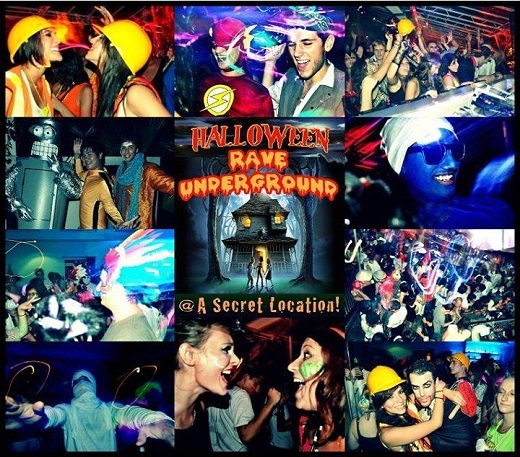 For further information, visit 2013 Halloween Rave Underground Facebook Event. Forget about the popcorn. You’ll be too busy screaming once you step inside Jiak Kim Murder Movie Village for the scariest cinematic experience you’ve ever experienced as the most horrifying pictures come to life at Zouk this Halloween. Whether you’ve a deadly weakness for Asian, classic or Sci-fi Horror, there’s going to be something wicked to whet your desires as you wet your whistles. Free & priority entry for those in FULL costume (as approved by the horrific door attendants, priority given to those dressed like obvious Horror Movie characters). Entry is not guaranteed if the club is full, so arrive early! For further information, visit Zouk Facebook Event.